تم وضع الأستقصاء على جروب خاص على الفيس بوك يضم اغلب الشركات المصرية المسجلة في قاعدة بيانات هيئة تنمية صناعة تكنولوجيات المعلومات المصرية … هذا الجروب يضم في اغلبه الشركات متناهية الصغر والصغيرة والمتوسطة وقليل جدا من الشركات الكبيرة … لذلك فأغلب المشاركين في الأستقصاء من اصحاب الشركات في السوق المصري. انا لست خبير موارد بشرية ولم ادرس هذا العلم ولكني محتك به، لذلك ان كان من خطأ في طريقة كتابة الأستبيان فلتسامحونا فيه. This blog is part of the study i recently published on my blog. you may download it from the following link. 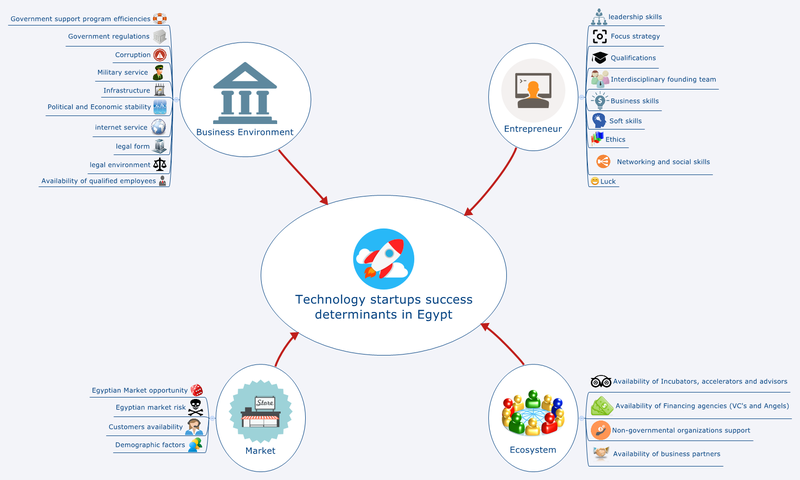 As mentioned in the title, this blog targets the success and failure factors and determinants of technology startups in Egypt. Although, i see it is applicable to any developing country or in countries where you find bureaucracy and corruption. The factors and determinants mentioned here are the factors we studied. some of them are major others are minors. Factors are defined from literature reviews and peers interviews. How do we define success. Success in business usually defined in terms of profit, usually expressed as “increasing shareholders wealth”. In startups, and specially in a country such as Egypt, the definition could be more deeper. Success is described by; the longer the entrepreneur can survive and prevent involuntary exit, the more successful he is. Below are the definition of each factors studied, and in a coming blog, we will study the effect of each factor. Leadership Skills: entrepreneur motivational attitude to motivate the employees to achieve the company vision and strategic objectives and goals. Focus Strategy: entrepreneur motivational attitude to achieve focusing on a few target markets who are distinct groups with specialized needs (Focus strategy rather than diversification strategy). Entrepreneur Qualifications: the effect of education, general experience and industry experience on all the business aspects. Interdisciplinary of the founding team: the founding team diversity in experiences, education, culture and even nationality. Business Skills: entrepreneur skills for recognizing opportunities and the entrepreneur’s willingness to take risk and their orientation to make money. Soft Skills: The characters and capabilities of attitude and behavior instead of knowledge or technical ability, Innovation, ambition, optimism, flexibility and adaptability. Ethical Behavior: Ethical entrepreneur is committed to achieve business success, without contradicting with personal ethics and values, his/her humanity and honesty are motives against unethical business temptation. Networking and Social Skills: The strong relationships with potential customers, business partners and government bodies. Luck: The force that causes things, especially good things, to happen to entrepreneur by chance and not as a result of his own efforts or abilities. Availability of Incubators, Accelerators and Advisors: Availability of entities that provide know-how for the new business entrepreneurs, such incubators act as business accelerators for the ICT startups, also they provide advisors and consultants in various fields like legal and marketing advisors. Availability of Business Partners: All partners that provide entrepreneur with important activities necessary for his success. Egyptian Market Opportunity: The presence of business need in the market to develop new products and services which are not fully supplied in the Egyptian market. Customers’ availability: The potential for the market current customers to purchase the product/service to generate profit. Demographic Factors: Unemployment, poverty, high dependency ratio, and illiteracy rates. Government Support Program Efficiency: The measure of how efficient the government support programs to provide financial, technical and non-technical support for ICT companies. Governmental Regulations: The governmental laws, rules and policies that affect the ICT industry either directly or indirectly. Corruption: The misuse or the abuse of public office for private gain. Military Service: The compulsory service in Egypt for males, from 14 months to 36 months based on the age and education level. Infrastructure: The basic physical and organizational structures and facilities (e.g. power supplies, buildings, roads,) needed for the operations of ICT enterprises. Political and Economic instability: The tendency of a government to collapse. Internet Services: The availability of different internet technologies which are efficient with reasonable prices, required for ICT companies in Egypt. Legal Environment: The power of law enforcement represented in laws’ entities, procedures and environment that protect rights and provide justice for ICT small business in Egypt. Availability of Qualified Employees: The ability to headhunt qualified and talented employees.